The Patented HotSlot Roof Ice Melt System is at the top of its class for energy efficiency and lowest in-place cost. It provides affordable protection for projects on a limited budget. 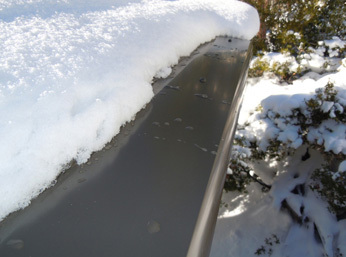 It helps prevent ice formations at eaves and damage to structures and gutter systems. HotSlot’s one-piece, one-size-fits-all eave ice melt system is ideal for virtually all existing composition shingle and most metal roofs. Its commercial quality, baked-on finish provides years of excellent weather and UV resistance. Regardless of roof slope or fascia angles, HotSlot’s smart design simplifies everything. It fits around most existing gutters and the heating system can be extended to gutters and downspouts. The heavy, highly conductive aluminum alloy eliminates the waviness (“oil-canning”) common with competing lightweight sheet metal systems. There are no unsightly fascia fasteners and the heater cable and slot are completely hidden from view. All these features ensure a rich, elegant, architectural finish. The UL-rated heating system uses self-regulating heater cable technology that distributes heat only where and when it is needed. The hidden slot adheres to the NEC’s Section 426 allowing cable insertion, inspection, and replacement in the unlikely event of damage or failure. Systems may be operated manually or with an automatic controller. HotSlot’s engineered profile strictly follows the 4 Rules of Thermodynamics, ensuring the most energy-efficient design possible. For commercial needs and heavy snow environments where maximum performance is desired, we recommend our more robust PRO or LT roof ice melt systems. HotSlot, the workhorse that provides the economy and performance you need. Protecting your property with an advanced roof ice melt system has never been easier or more affordable. At the heart of HotSlot is a self-regulating heater which is surrounded with a massive, highly conductive aluminum alloy. Shown here with the Medium Bronze factory finish. HotSlot is EASY. It’s installed directly onto most existing shingle and metal roofs with little or no preparation needed. There is no clamping, no drilling, nor special bending needed. The pre-drilled 8’ lengths are easy to handle and install. With composition shingle roofs, the top flange tucks under upper shingles, With metal roofing, HotSlot is simply inserted under the roofing panel. Matching waterproof screws effortlessly secure the system in place. The heater cable is then inserted into a tight slot in the rear of the drip edge. 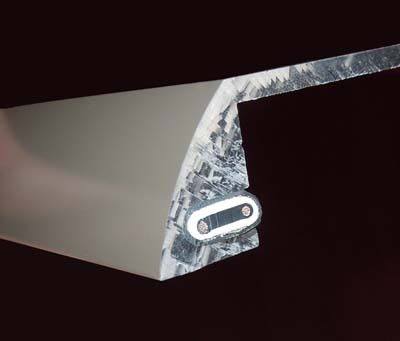 This no-air-gap slot provides superior heat conduction from the cable to the massive panel and integral drip edge. Combine HotSlot with the Valley/Channel for complete protection. Control options include manual operation and our digital controllers. 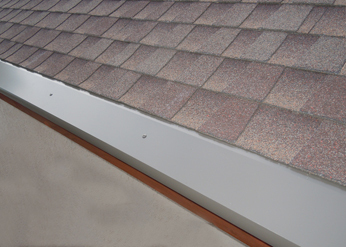 HotSlot is easily installed onto composition shingle roofs.